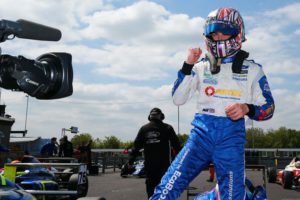 Jamie Caroline entered the record books by winning all three F4 British Championship certified by FIA – powered by Ford EcoBoost races at Thruxton and seven for the season. 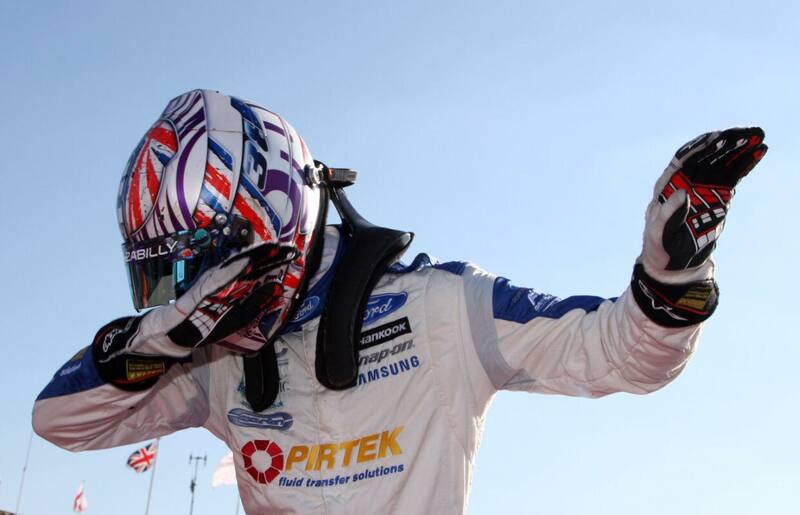 The Carlin racer became the first driver in the history of British F4 to take a hat-trick of victories in one weekend. In doing so he extends his advantage at the top of the standings to 86 points. Qualifying a reasonable third for Race 1, Caroline was confident that victory could still be in sight. A good start from third on the grid failed to pay dividends due to an off-track excursion, only to see him bounce back. Having fallen to seventh, Caroline was already up to fourth heading into Club towards the end of the fourth lap. Caroline then dispatched poleman Oliver York, Alex Quinn and Logan Sargeant in one fell swoop on the very same lap. As the three drivers squabbled through Club, Caroline pounced with a better exit from the chicane, boldly running around the outside of the trio and into the lead of the race by the time he crossed the line to commence lap four. Caroline immediately set about breaking the tow to the cars behind, building a gap of over two seconds which he carefully protected on his way to the chequered flag. 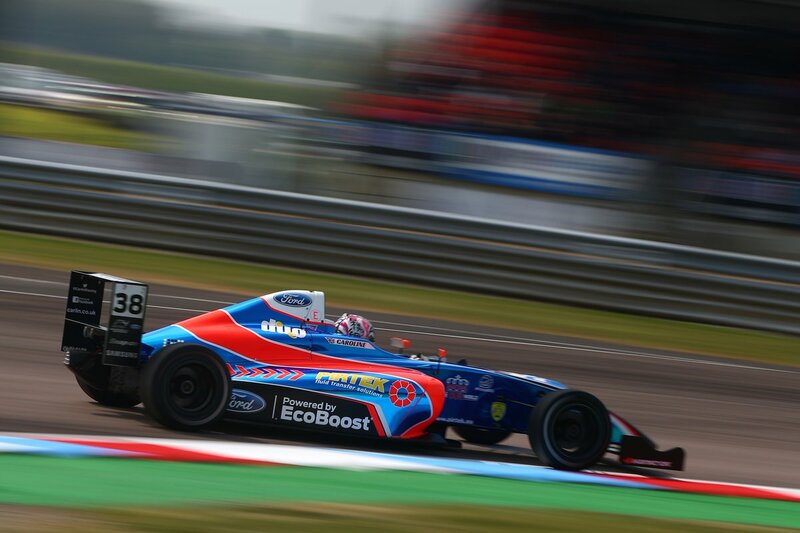 Race 2, and the reverse grid saw Caroline line up P6. A trademark Caroline flying start saw him propel his way from sixth to first by the time he reached turn two. However, he was unable to break clear of the field. A fascinating battle ensued as Lundqvist rapidly closed in on Caroline, finding a way past on the drag up Woodham Hill, only for Caroline to strike back a lap later into the final chicane and go on to take the chequered flag as more drama unfolded behind him. Race 3 saw Caroline line up on P3. As had been the case in the first race of the day, Caroline wasted no time on the opening lap dispatching Oliver York and Alex Quinn. Finding himself with clear air ahead he escaped the clutches of the chasing pack, setting fastest lap on the way to a historic win. This epic achievement sees Caroline place himself into the history books being the first ever F4 driver to win all 3 races in a weekend. “It seems like everyone is a little bit hesitant on the first two laps. I’m not sure why, but maybe this weekend will act as lesson for them that they can push a lot harder. “Having fresher tyres for this race compared to the earlier race today made such a difference. Not so much in terms of pace, but in terms of comfort and the margin with which I could push. “The car felt unreal all race. It was on rails which meant I could lap so consistently, breaking the tow and pull away from the chasing pack.